Make five postcard-size black backgrounds and five postcard-size white backgrounds, using poster/acrylic paint on cartridge paper, watercolour paper or cardboard. • grey acrylic or gouache. Don’t forget to make brief notes in your learning log when you’ve completed this exercise. Please click on each image to enlarge it and to open it in a new browser tab. Black calligraphy ink on white gesso – reasonably straight forward to apply the ink to ground using a fine round brush, thinning with water to introduce tone and allowing the white ground to shine through for highlights. 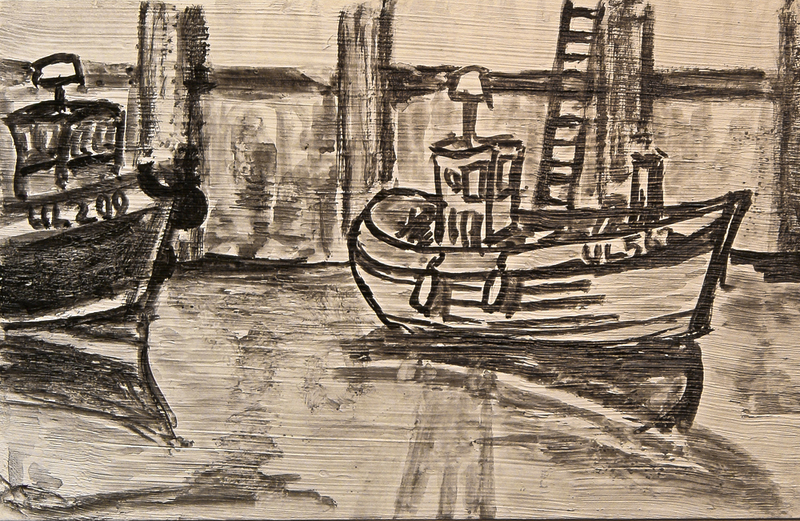 Same black calligraphy ink on black gesso this time – quite difficult to achieve anything like a recognisable image. 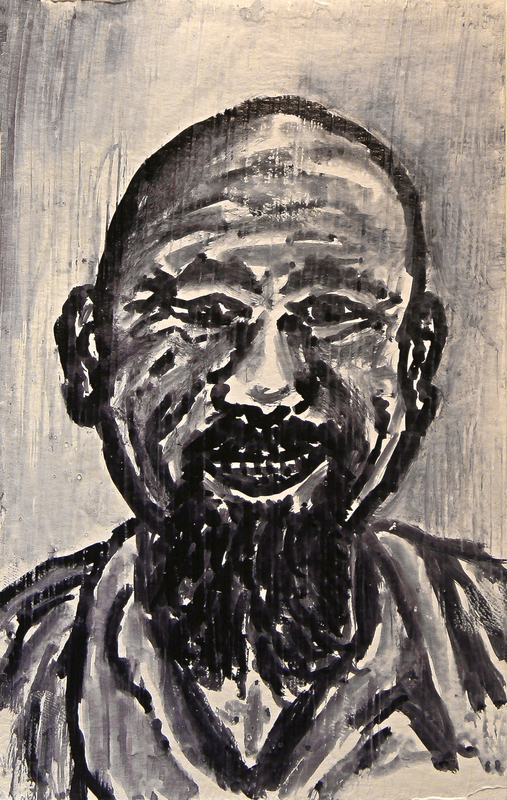 I had to apply a number of washes of the ink to build up enough of an image to appear against the black ground and used a touch of white ink to feature the teeth in the smiling mouth. Not easy. 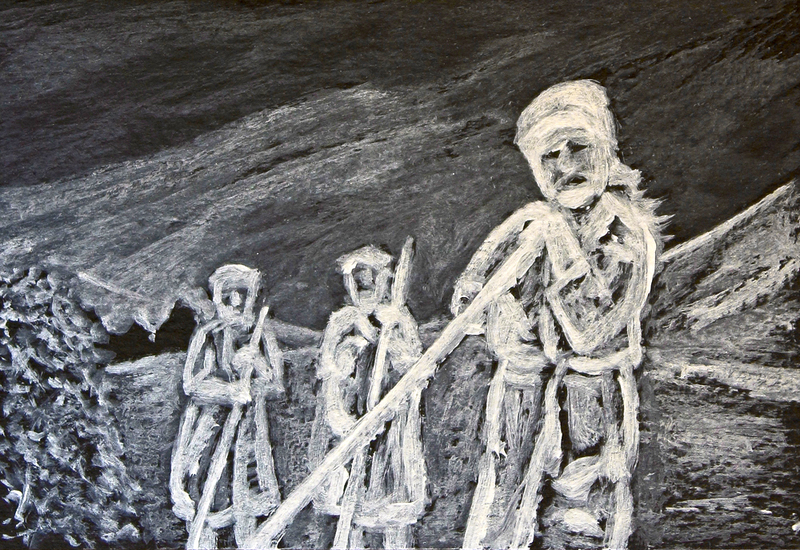 Black acrylic on white gesso – as with the ink, this was reasonably straight forward to bring out a recognisable image of the three Russian women haymaking. Quickly done. 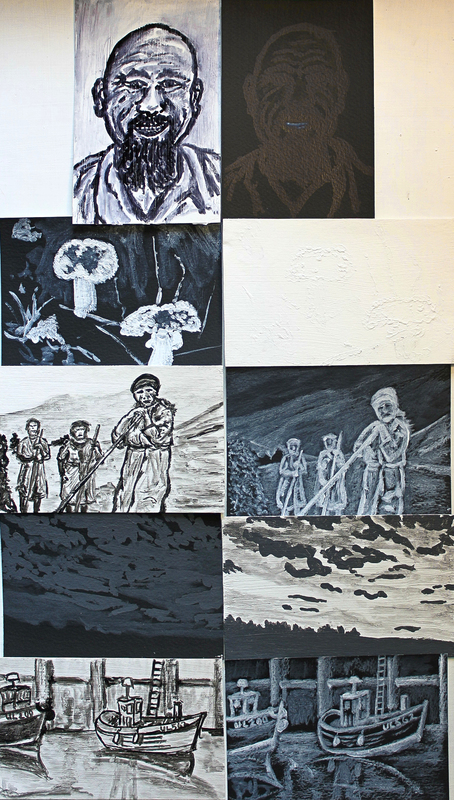 White gouache on black gesso – surprisingly, several applications of white gouache were required to build an image against the black ground as each one applied seemed to fade into the black. 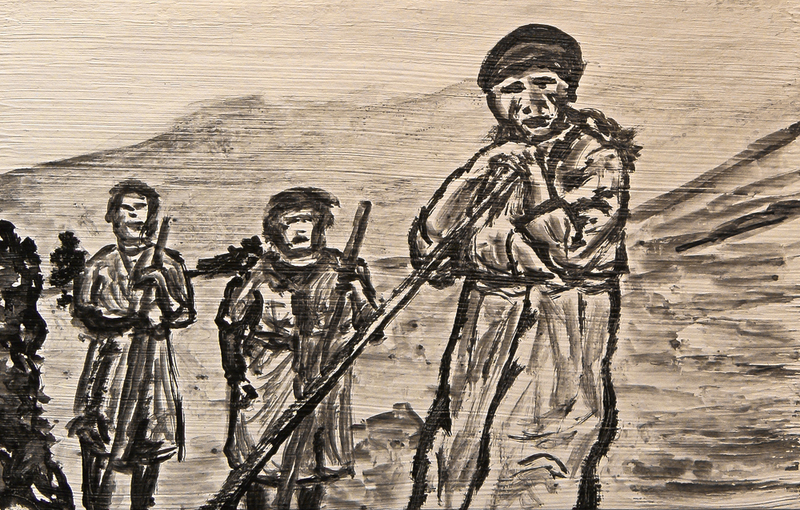 Water was used to thin the paint for some of the background tones and the black ground allowed to peak through in places, especially in the haystack, the two background trees and the eye sockets, mouth and general facial features. Pretty tricky and took some time. 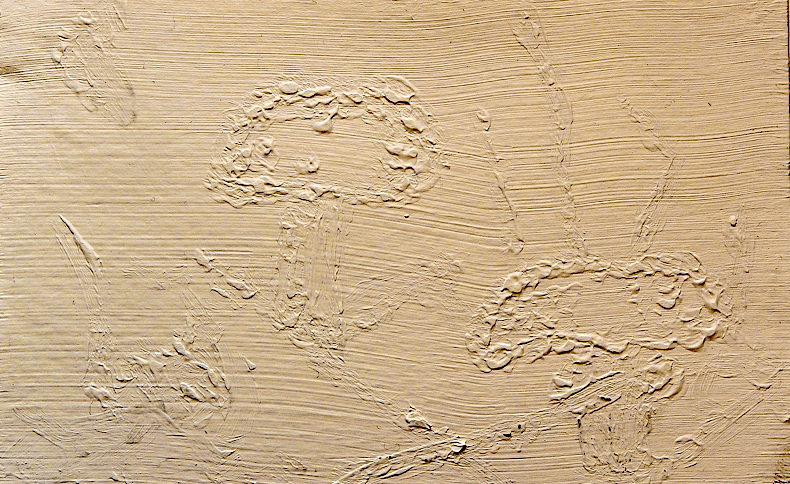 White acrylic on white gesso – seemed an almost impossible task and in essence I found that the only way to really get anything like an image using white on white was through texturing the white acrylic to stand out from the background. Again this took some time to complete with layering wet on dry. 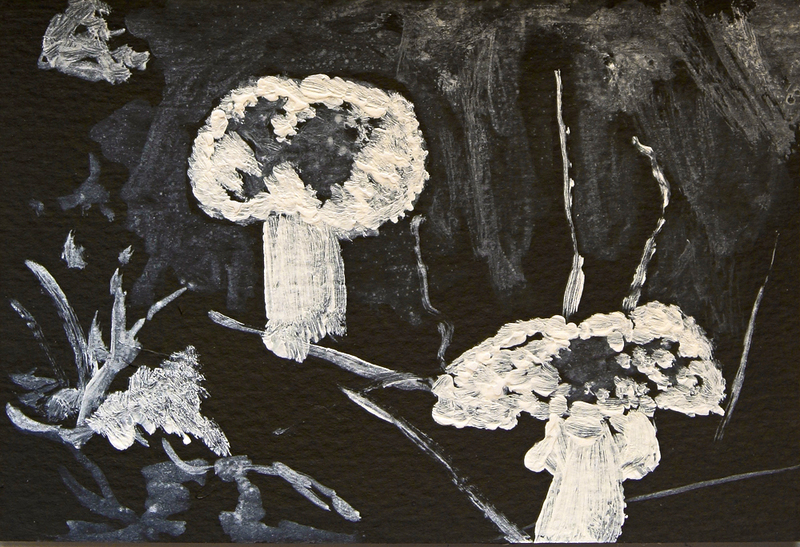 White acrylic on black gesso – the white acrylic had to be layered in order to build the mushroom images as once again each application soon faded into the ground. The finished effect of white standing against black is quite pleasing and I thinned with water to mark in some background wash in an attempt to suggest the forest environment of shimmering spiders webs. 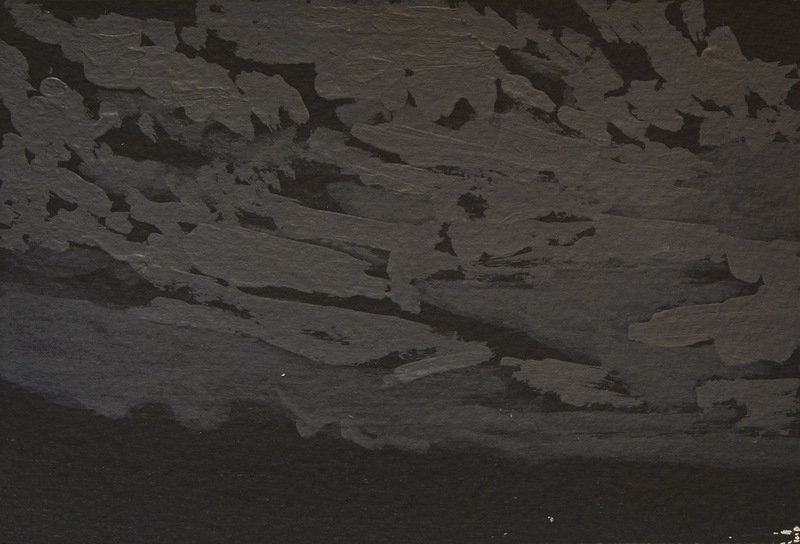 Grey gesso mixture on black gesso – a tricky challenge to depict the sky. The negative space of the foreground trees and sloping landscape was easy enough, leaving the black ground to do the work for me. Trickier with the clouds though using thicker paint and thinner washes and black ground to try and pick out a recognisable image. Not sure it’s all that successful. 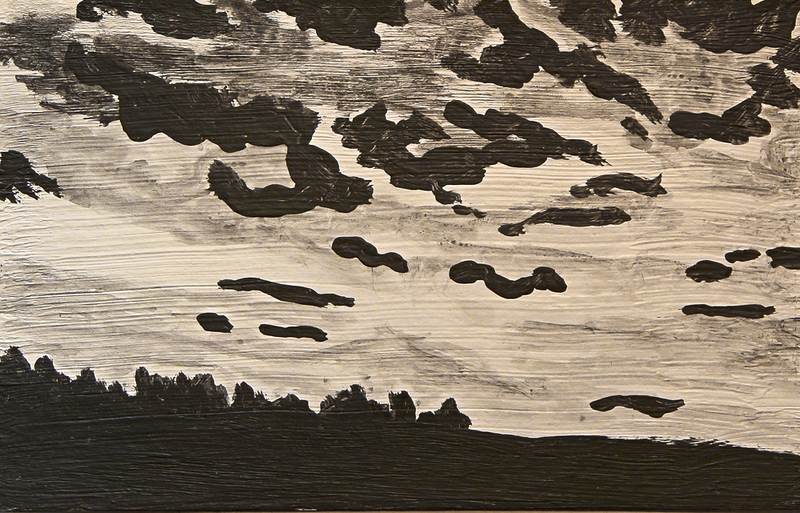 Grey gesso mixture on white gesso – Again using the black ground as the techniques to bring out the negative spaces on the foreground and darker patches of the clouds and different washes of grey paint to add texture to the sky. 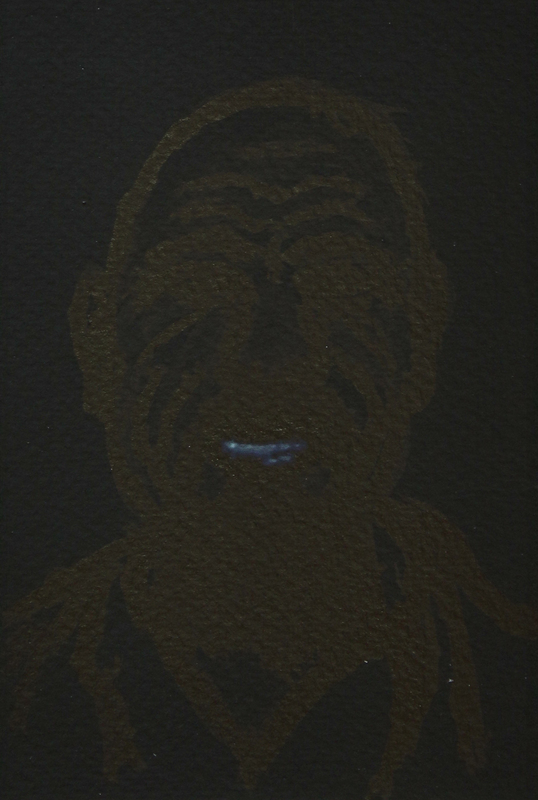 White gouache on black gesso – several application of gouache were again required to bring out the image from ‘sinking’ into the black ground. 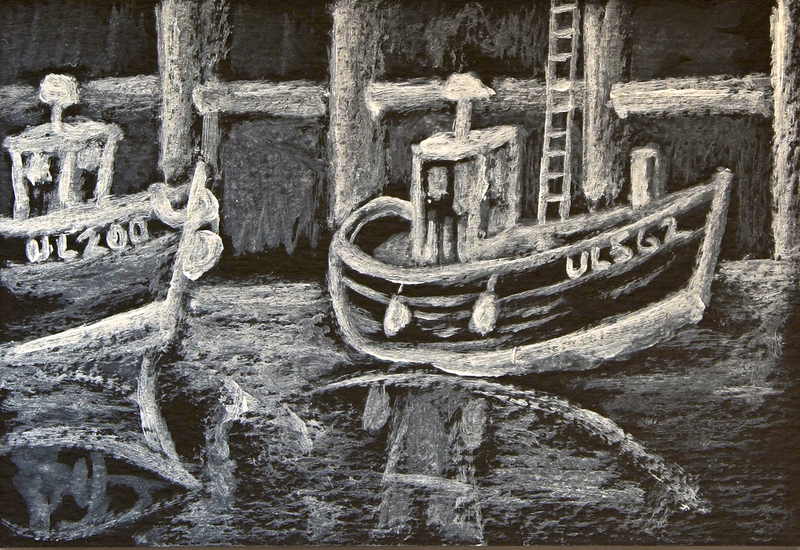 In fact the application of the foreground white washes to pick out the reflections in the water were easier and quicker to achieve than were the two boats. Black acrylic on white gesso – Fairly straight forward application of black on white this time, using the white ground to show through where required to pick out highlights and thinning the black acrylic in stages to lay out the water reflections.